The (1906) covers the Nelson, Marlborough and Westland provincial districts. It records the biographies of professional and tradespeople in some detail with entries ranging in length. Suburbs and their leading citizens are also covered. The volume lists societies, organizations and institutions and provides biographies of prominent members. It outlines the process of government and names leaders of the Legislature. Cyclopedias are encyclopedias and considered as reference works containing articles on various topics dealing with the enhancement of knowledge. 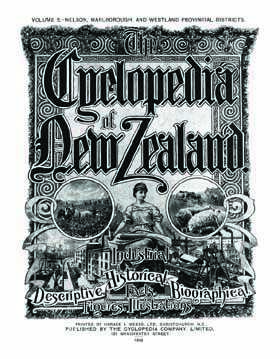 The term cyclopedia tends to be used by more popular publications with a particular specialty or locality in mind.